This jumpsuit was inspired, although in the loosest possible sense, by a visit to the Alexander McQueen exhibition at the V&A earlier this year. One of the models on display was a beautiful black evening jumpsuit with an asymmetric draped lapel detail. 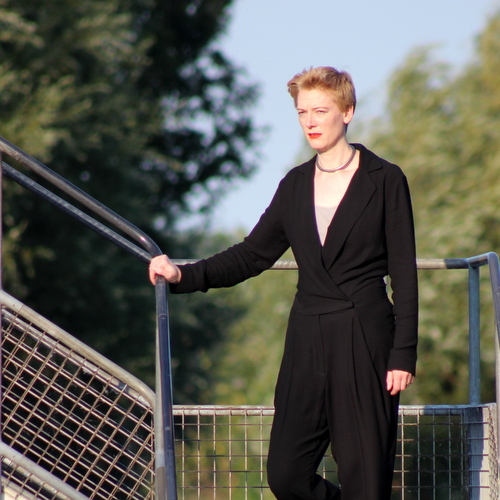 While I couldn’t come anywhere near reproducing the inspiration, seeing it did remind me that I’d put a slightly formal jumpsuit pattern on my to-sew list a while ago and that I had some black crepe in the stash. So this is Burda 2014-04-111 made up in black poly crepe. In recent years Burda has taken to labelling certain pattern in the magazine as ‘masterpieces’ and this is one of them. It’s not clear whether ‘masterpiece’ is meant to mean it’s difficult to sew or takes a lot of time or both. This one certainly took forever to make, but I couldn’t describe it as my best ever sewing. On the other hand it’s my first attempt at a notched collar and it came out reasonably symmetrical, so I’m delighted with that. And I made it using only Burda’s instructions. They seem to make more sense these days, or perhaps I’ve finally tuned my brain in to the less than idiomatic translation from German. It always amuses me that they say things like ‘stitch again close to seam’ instead of simply ‘understitch’. It’s come out a bit baggier than I expected. It’s meant to be a loose-fitting style but the version on Burda’s model looks a bit sleeker than mine. Once again I think I’ve made the legs too long which contributes to the effect. I think I took most of the length I added in the legs off again before hemming, so I can safely say this one runs long. 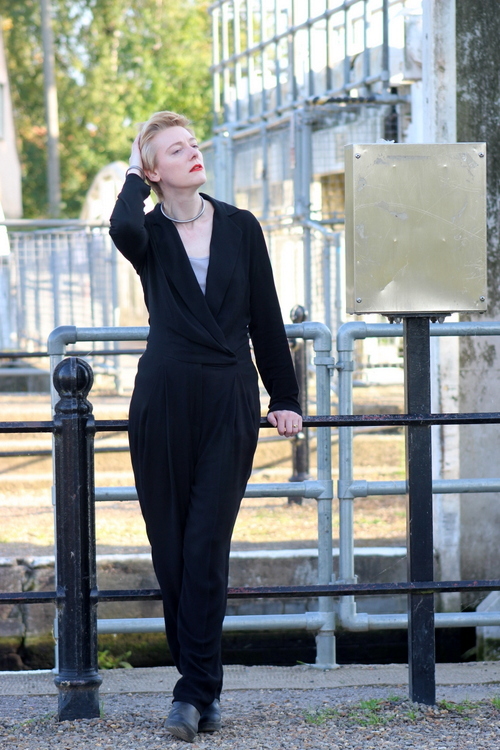 But I hate trousers that are too short; one of the reasons I started sewing my own clothes was in order to have things where the legs and sleeves are long enough. At least there’s no danger of revealing my woolly socks. Here’s me with Mrs Burda below for comparison. Her jumpsuit is a lot better pressed than mine. I had been wearing mine all day when the photos were were taken and I don’t think this crepe holds a crease all that well. I doubt I’ll bother pressing the creases back into the back legs after I wash it. They certainly don’t seem to have survived for the photos. The pattern comes with two views, one of which doesn’t have the creases pressed in, so I may claim my version is View B whereas Mrs Burda is definitely wearing View A. The other differences between the views are that A has a modesty panel and closes with snaps instead of buttons. I skipped the modesty panel as it’s easier and safer to wear a tank top under this. I did use snaps though. I’m not entirely sure what shoes go with this. It’s an evening style, but realistically the place I’m going to wear it is to work on days when I want to look a little smart. This means reasonably comfortable footwear is required. The wedges I’m wearing here are about the limit of what I can manage at work. If anyone has any better ideas than the wedges I’d like to hear them!